Novelizations generally come out at the same time as the movie/TV show/event that they are tied in to. There seems little point for a novel plugging a 20 year-old comic series to come out now (unless its publication was coinciding with the publication of the sequel to the original comic series. Maybe there is a method to this marketing madness after all). To begin, originally there were the original DC heroes of the 1930s and 1940s Golden Age: Superman, Batman, Wonder Woman, The Flash, Green Lantern et al. But after the war, many comics were cancelled and some heroes disappeared for a while. Batman and Superman continued, but The Flash, Green Lantern and others dropped by the wayside. But in the 1950s and 1960s, DC began introducing updated versions of these forgotten heroes. The “old” Green Lantern, Alan Scott, was a railroad engineer who came upon a lantern forged from a mysterious metal that gave him super-powers, while the “new” Green Lantern, Hal Jordan, was chosen to join an intergalactic police force and given a ring that allowed him to give form to whatever he willed. The original Flash, Jay Garrick, was a college student who inhaled “hard water vapours” and gained super-speed, while the modern Flash was Barry Allen, a police scientist who suffered an accident with chemicals and was imbued with super-speed. As the new so-called Silver Age heroes grew in popularity, the natural idea occurred – what if the new Flash met the old Flash? To accomplish this, the writers at DC used the old parallel worlds idea: the current Flash, and his contemporaries, lived on Earth-1, while the previous Flash and his contemporaries lived on Earth-2. The Flash crossover proved so popular that soon the Green Lanterns crossed over, followed by whole leagues of heroes in annual crossover events. DC began adding more parallel worlds to their canon. There was Earth-3 where the heroes were the bad guys and the super-villains were the heroes. There was Earth-S where Captain Marvel and the Marvel Family lived. There was even Earth-Prime where the DC Comics writers lived and wrote the stories that played out across what was now referred to as the DC Multiverse. By the mid-1980s, the powers-that-be decided that the DC Multiverse had grown so huge and unwieldy that new readers would be lost learning the previous continuity, and decided to do what is now called a re-boot of the DC Multiverse and collapse it into a single universe that would be easy for writers, editors and new readers to keep track of. Enter Marv Wolfman and George Pérez who respectively wrote and drew Crisis on Infinite Earths, an award-winning 12-issue mini-series that tore the DC Multiverse asunder and rearranged it into a single, cohesive universe. Sort of. 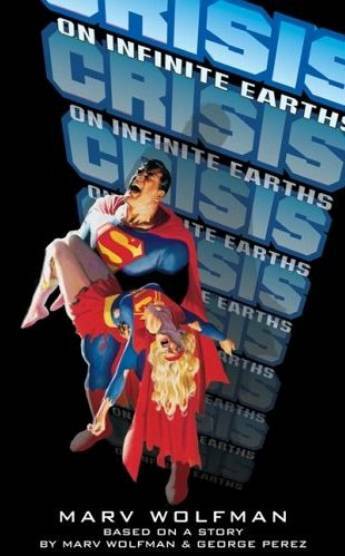 And in 2006, as DC prepared another massive crossover event, Infinite Crisis, to repair the continuity ruptures of the previous 20 years, iBooks published Wolfman’s novelization of the original series. Barry has become “unstuck” in time and his incorporeal form bears witness to multiple plot threads, presented in a non-linear manner. As a plot device, it’s a smart way for Wolfman to juggle his numerous stories as the various universes are destroyed by a being known as the Anti-Monitor, who, like most super-villains, can only come up with schemes that require the destruction of All Existence in order to succeed. (Whatever happened to knocking off the corner liquor store? But I digress.) It does make for confusing reading at first, as Barry is just as lost as the reader is, but soon Barry is up to speed with the story and so are we. There’s no point trying to explain the particulars of the story, and it flies by so fast that who really cares anyway? And the legion of super-heroes (pun intended) that are briefly mentioned must be in the hundreds. Most rate merely a line or two. That said, Wolfman does manage to capture the essence of many of these one-line characters, and he finely draws the personalities of the main players of Batman, Superman and Wonder Woman. He does an especially fine job with Barry, our narrator, and captures the heroism and the tragedy in this doomed character. If you really want to read this story, find the original comic. It’s readily available in graphic novel form. But if you’re looking for a few hours to kill with some light reading about the end of everything, this will do the trick, too. Review by John W. Herbert.